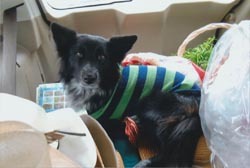 A Carey-area woman is looking for answers after her dog was apparently caught in what she believes was a coyote trap in January, leading to amputation of the dog’s leg. Bonnie Newton said her dog, Midge, was out patrolling her 1,400-acre property in early January and disappeared. The dog didn’t come back until several days later, limping on a damaged paw. Laurie Breedveld, a veterinarian at the Sawtooth Animal Center, said the dog had been missing for three days in freezing temperatures. Breedveld and veterinarian Mark Acker determined that the dog had been caught in a trap because of the markings on the injured paw. Breedveld said the paw had likely gotten caught in a trap, rather than a snare, and froze due to the lack of circulation in the paw. The entire leg was amputated several weeks later, on Jan. 28, leaving Newton with a $1,400 vet bill that she said she can’t pay. “We don’t have hard facts, but my guess is that she was caught and stuck in a trap, and whoever came by checking their trap lines loosened her up and she got away,” Breedveld said. Though wolf trapping is illegal in the Southern Mountains zone that encompasses the Carey area, coyote trapping is legal throughout the state year-round, so long as the trapper has a proper license. However, no statistics are kept on incidental takes from coyote traps. Nokkentved said some counties and cities have ordinances in place to limit trapping. However, Blaine County has no such ordinance. Breedveld said her clinic sees maybe one dog a year that has been caught in a trap. “It’s not a huge problem,” she said, but cautioned that dogs allowed to roam loose can smell the bait and are likely to get into trouble. Newton said she is outraged that someone set what she considers an unnecessary trap. Wolf trappers reported catching 45 deer, nine mountain lions and nine domestic pets in the 2011-12 trapping season, according to a recently released survey from the Idaho Department of Fish and Game. The report, released by State Wildlife Manager John Rachael in mid-February, was the result of two surveys of trappers conducted last year. One hundred forty-three respondents said they trapped for wolves, capturing 147 other animals accidentally. Sixty-six of those animals were released alive, while 69 of those animals—including 38 coyotes—were killed. Seven of the nine domestic pets were released alive.